As we age we begin to experience changes. Sure, our hair turns grey and we need glasses and can’t hear as well. However, there are much more concerning changes we experience. Our muscles become weaker, balance is impaired, bones become more brittle, and we begin to slow our walking pace. Things that were easy to do a few years ago are now more challenging. Things like walking to the grocery store, which we never gave any thought to, now require much deliberation. How much pain will I have in my knees going down the steps to get out - and then up the steps to get back in? Will I be able to carry the groceries in or will I need to ask someone to help me? Will the store have a shopping cart for me to lean on while shopping? Is it safe for me to walk in the street by myself or is today the day I am finally going to lose my balance and fall? Will I be so tired from going out that I will need to take a nap when I get home? If these (or similar) thoughts are going through your mind before you leave your house...you are not alone. Not even close! So many seniors are faced with these and other issues every day. Maybe you are confident that you won’t fall but you suffer from back pain that prevents you from shopping unless you lean on the shopping cart. Or, maybe you can walk with your friends but frequently need to stop and rest because your legs feel heavy, tired or your back and hips hurt. If you have these concerns...you are in very good company. These are just the tip of the iceberg when it comes to aging. Unfortunately, too many people see these problems as inevitable and therefore do nothing about them. Or, you try something (medication, injections, etc.) and if it doesn’t work you just completely give up and try to ignore the fact that they’re getting worse. That’s the #1 mistake people make with problems associated with aging! The more you ignore these issues the more they will impact your quality of life. Many of these problems can be addressed through natural means. The most valuable of which is EXERCISE. Not just taking a walk everyday (which is a good idea) but exercise that specifically targets the concerns that impact your quality of life. You might be thinking to yourself it would be a good idea to exercise, but……. What exercise is the best for me? How can I do it without hurting myself? How much should I do to get the benefit without overdoing it? What exercise is best for arthritis? These are legitimate concerns... but there is a solution. You need to find an expert in aging, movement and health and exercise. The place to find body and aging experts is Pinnacle Physical Therapy. At Pinnacle Physical Therapy we have therapists that work one on one with every patient to not only help relieve their aches and pains but to improve their overall health and wellness as they age. We do this by incorporating a progressive and comprehensive and experience in each physical therapy session and ultimately transitioning our patients to independent exercise programs at home or at local gym facilities, so they can continue to progress on their own. If you are looking to improve your health, wellness and quality of life, you owe it to yourself to schedule an appointment. 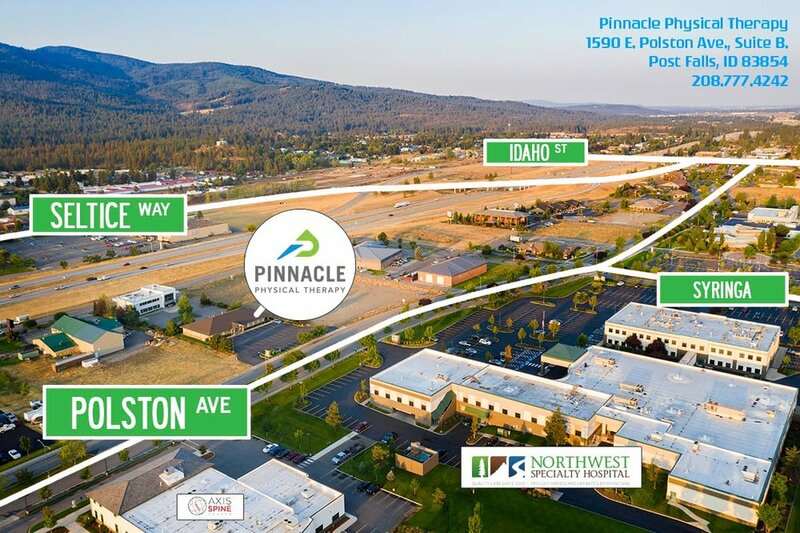 We are conveniently located in Post Falls, on Polston Ave. right across from the Northwest Specialty Hospital. Call 208.777.4242 to schedule an appointment and begin to take control of your future. Worried that you are too old? Not the case at all. The human body can continue to make strength gains, improve balance, walk better and improve posture well into the 90’s. Worried about the cost? Don’t be. We accept most insurances, including Medicare, and will work with you to make sure you get the care you need and deserve. Still not sure? Call us at 208.777.4242 and we will gladly explain exactly what your insurance will cover and alternative payment options and plans. Your health and safety are too important to ignore. Call today to take your first step toward a more active and enjoyable Golden Years!